Before you address ax handle prep in any way, you’ll want to seal the junction between the head and handle, in order to protect it against moisture. This will prevent the wood from shrinkage and swelling at the eye and keep everything tight. No matter how snug the fit is here, moisture can enter the unprotected wood. For this job, you’ll need to dip the ax, head down, in a 50/50 mixture of boiled linseed oil and kerosene. The kerosene works to thin the oil for improved absorption. A good layer of this oil inside the crevices between handle and eye makes the head far less likely to come loose due to the swelling and contracting of the wood caused by changes in temperature and humidity. To begin the process, give the head a heavy coat of petroleum jelly to prevent the boiled linseed oil from coating and discoloring the ax. Coat the first three inches of the handle (below the head) as well (this will prevent the wood from absorbing the boiled linseed oil). Take care to not over the gap between head and handle at the top or bottom to allow the boiled linseed oil to soak in. Now, place the ax head down in a bucket of the oil/kerosene mixture, making sure that it’s deep enough to cover the entire head and about an inch of the handle. Leave the ax in the bucket overnight, which is long enough for the wood to absorb the oil completely. Then remove the ax from the bucket, wipe the head and handle clean and rest the ax head down on a piece of waxed paper or aluminum foil. A lot of the oil will drain out of the head/handle joint over the next few hours and you don’t want to get it everywhere. Check the ax occasionally and if you see a puddle, wipe it up. After an hour or so, wrap the handle in a paper towel and turn the ax right side up to allow any oil to drain out of the bottom of the head. Once drained, wipe everything dry. Depending on the humidity, the oil will fully cure in a week or so. Time spent prepping and sealing the handle will make a real difference in how long the handle lasts and how comfortable it is to swing. No ax brand I know of delivers their products with this job done completely (or at least to my satisfaction). Let’s look at the handles provided by the manufacturers of modern axes. Most “hardware grade” axes are delivered with varnished or polyurethane coated handles. These hard, slick coatings must be removed as they make for a blister causing ax. Some makers, such as Council Tool, offer their axes with lightly waxed handles. This is a far better finish than the slick, sealed finishes. However, most factory waxed finishes are too light to offer much in the way of real water resistance and even if the wax were heavily applied, it does little to prevent the wood from drying out. The ideal finish should offer good long-term water resistance and condition the wood. The only finishes I know of that do that are oil finishes. Oil keeps handles in top shape, resists moisture and allows you to feel the texture of the wood without causing blisters as you swing the ax. Though oil finishes offer good protection most of the time, if you carry your ax in predominantly wet regions, you may want to apply an oil/beeswax mixture to the wood. The wax offers better water resistance than oil alone. When done, wet the handle thoroughly with water and let dry. This will raise the grain of the wood. Sand the handle again, using 100-grit sandpaper, to smooth the raised grain. Repeat this wetting and sanding until the grain can no longer be felt after the handle has dried. These steps will ensure that if the ax is wetted in prolonged rain, the handle will remain smooth and not produce blisters. Give the bottom six inches (or up to the bend of the handle if it’s curved), a final sanding with 60-grit paper to provide a slightly coarse texture for the grip hand. Finally, sand the cut ends of the handle (the eye and the handle bottom) up through 220-grit abrasive until polished smooth. Now the handle is ready to accept a new finish. Even if I plan to use an oil/beeswax finish, I start by giving the handles several coats of raw linseed oil (food-grade flaxseed oil). Warm about four or five tablespoons of the oil in an iron vessel until it just begins to smoke, then rub it into the handle with a rag. Do not immediately wipe off the excess oil. Allow at least an hour for the oil to fully soak into the wood. Before applying the next coat, wipe the handle down. At least three or four coats should be rubbed into the handle, repeating the applications over the next couple of days. Once the handle begins to take on a soft sheen, you’ll know that it has been fully saturated with the oil. Handle treatment is not done until you’ve sealed the cut ends of the handle. This step is important. On many old axes, you’ll discover that the ends are often checked and cracked. That’s due to water penetrating the fibers of the wood over time. No amount of oil or wax will do the trick here. You’ll want to completely seal the ends with an impenetrable finish. For this purpose, I use Tried and True Varnish Oil. This product is a completely natural linseed oil and pine resin varnish. In Europe it’s known as hard oil. The formula is actually coachmaker’s varnish, a product dating from the 1850’s. Varnish Oil produces a highly durable finish that soaks deep into the grain of the wood to seal completely, leaving a flexible, semi-gloss sheen. The maker claims that Varnish Oil is for indoor use only but I’ve found that it works fine for this purpose. The stuff is expensive ($18.00/pint) but is applied in very thin coats, so a little goes a long way. At the eye, I use a foam brush to apply a coat thick enough to fill the spaces between the eye and the head. On the bottom, I apply a thin coat. Allow the oil to absorb for an hour before wiping completely dry and buffing with a soft cloth. Let this cure for at least 24 hours, then burnish with #0000 steel wool. Repeat at least three or four times for full, long-term protection. 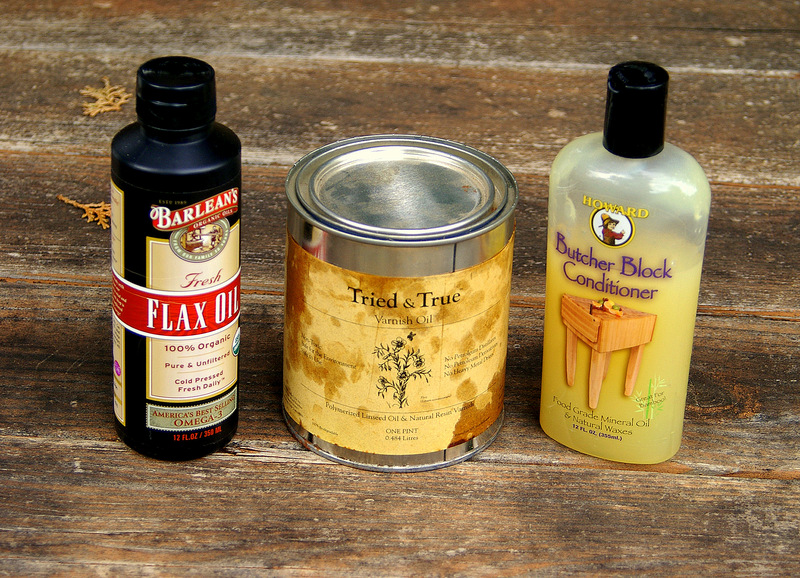 Handle Protection: Left to right: food-grade flaxseed oil (raw linseed oil), Tried and True Varnish Oil (Coachmaker’s Varnish) and Howard’s Butcher Block Conditioner (a semi-soft, food-grade mineral oil and wax blend). After the handle has been completely protected with an oiled finish and the ends sealed with varnish, you may want to protect it further for use in very wet weather. This is where an oil and beeswax treatment comes in. I use this wonderful mixture for so many things. It is valuable for protecting ax heads and carbon steel knife blades from rust and for treating leather knife and ax sheaths in addition to using on wood handles. To make the compound, place a beeswax disc (the kind sold for lubricating wooden drawer glides) in a half pint, wide-mouth Mason jar and add raw linseed oil to cover by more than double. Heat the mixture in a microwave oven on medium power until liquefied and stir well. Let cool until the compound hardens to a paste that is softer than the consistency of shoe polish. It should glisten with the oil when your finger is rubbed over the surface. However, it should not be so soft as to be more oily than waxy. If you don’t like the consistency after hardening, just reheat, add more wax or oil as needed, microwave on medium, blend and cool again. Oil and beeswax paste can be stored indefinitely. To apply to wood handles, I reheat the compound until liquefied and rub the hot mixture into the wood. This insures complete absorption. For subsequent coats, just apply it in the solidified state to the handle and rub it in. Just one or two coats do the trick. Note: I’ve experimented with Howard brand Butcher Block Conditioner on handles in place of my homemade compound with good results though the product doesn’t have as much body. It soaks into the wood readily and is easy to apply. After this initial prep and treatment, wood handles should be oiled at least twice a year or more if you live in an arid climate. If the ax has been carried for long periods in rainy or wet snowy conditions, allow the handle to dry for several days before re-oiling. To clean a dirty handle, sponge it with a mixture of Murphy’s Oil Soap and water, allow to dry, then reapply the raw linseed oil. Reapply a coat of varnish to the top and end of the handle occasionally. The chief enemy of an ax head is rust. Protect it by applying a coat of the magical mixture. First, rub the ax head with a light machine oil (I use Ballistol), then heat the linseed oil/beeswax compound to soften it and apply a coating to the head. Upon cooling, the wax will harden a bit, leaving a protective coating on the steel. After you’ve worked so hard to get your ax in shape, you’ll most likely want to hang it above the fireplace like a trophy fish. And no doubt it would look great there, especially in a log cabin. However, you DO NOT want to store your axes indoors in a dry location. The constant lack of humidity will cause the handle to shrink enough to become loose. It’s best to keep axes in a shed or garage, protected from moisture but still subjected to humidity and changes in temperature. There will be some who won’t go to all this work for an ax. Axes are not valuable to our daily existence like they once were and do not merit the same kind of care they were given in the past. Yet, there still exists a small cadre of serious ax users that use and depend on their wilderness ax. And there are the cabin builders and other craftsmen who use fine axes to shape wood. These folks always take the time to properly prep and care for their axes. If prepped correctly and cared for, a fine ax can be passed down for generations. Yours could too. This entry was posted on Sunday, September 29th, 2013 at 8:17 AM	and is filed under Edged Tools. You can follow any responses to this entry through the RSS 2.0 feed. You can leave a response, or trackback from your own site. Awesome article, I’m going to try this on my axes. Question though, would substituting turpentine for the kerosene cause a problem? Thanks in advance for the information and great job on the blog, I read it constantly. I don’t think turpentine would cause a problem. 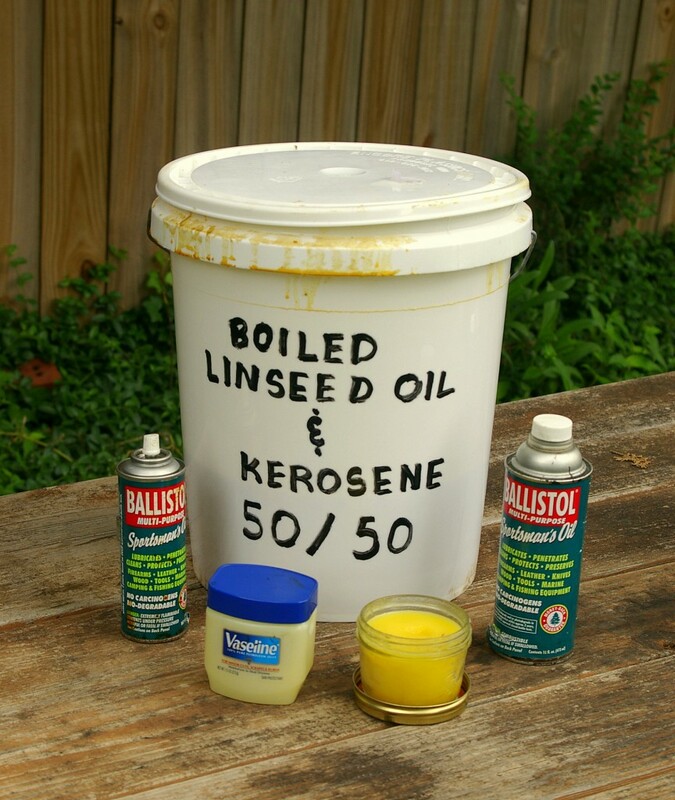 The function of the kerosene is to thin the boiled linseed oil enough to easily be absorbed into the small crevices of the head/handle junction. It seems to me that turpentine would do the same thing. Thanks for the kind words! 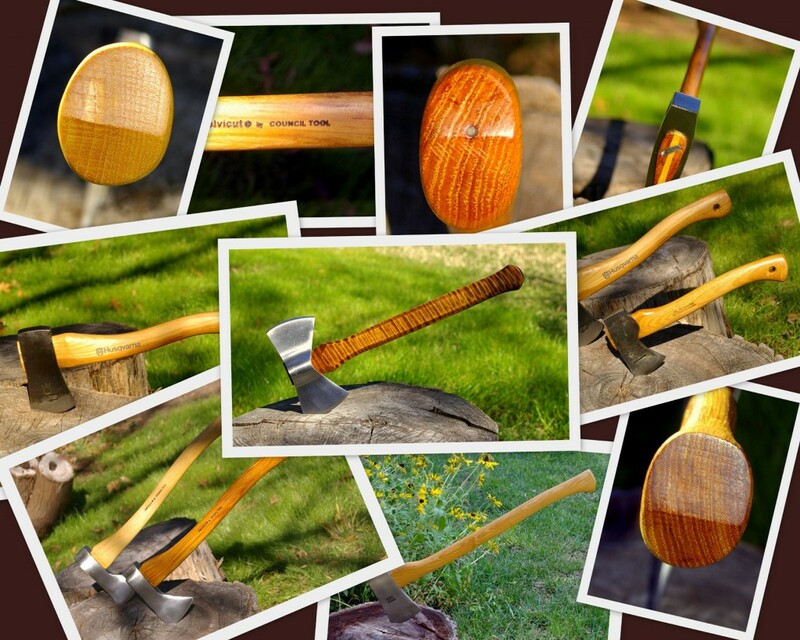 Great article on the care and preservation of wood handle tools. Any thoughts on the use of lemon oil on wood handles? It is recommended for musical instruments such as guitars, mandolins, violins etc. Its nice to know that there are folks out there that value this kind of information and prefer tools of quality not the garbage from China that is passed onto today’s consumer. 2. Applying Howard’s Butcher Block conditioner to both the axe handle AND lightly on the axe head? Thanks; good article. We have radiant heat in our house so moisture is not an issue…pretty sure she’ll be hanging above the fireplace in good order. This is a great read. I pulled out an old axe that had been sitting under the porch and the handle was rotten inside the axe head. I broke off the handle with ease. WINTER PROJECT! Stumbling across this write up made my day. I’ve refinished a few gun stocks so I have some Birchwwod Casey Tru-Oil lying around that I’m going to use to seal the ends. It sounds a lot like the Varnish Oil you mentioned. It soaks into the wood, drys hard, water resistant and gives a satin finish. Other than that, I’m following your recommendations. Your process for the axe handle sounds like an interesting way to refinish, and maintain, a wooden gun stock. Hmmm, now that might be interesting. Thanks for taking the time to write this up. The details and pictures made it an excellent read.